Written by Barito Tacos & Cocktails on April 4, 2019 . Posted in Blog, Holidays & Celebrations. National Burrito Day is celebrated every year on the first Thursday of April. Burritos are a classic dish, perfect for satisfying your hunger, whether it be for breakfast, lunch, dinner, or a snack. 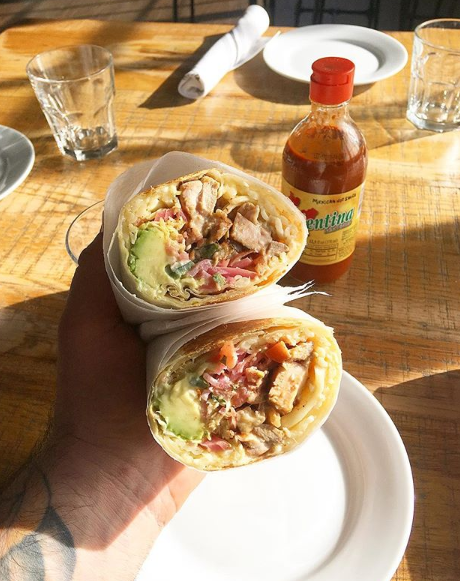 This National Burrito Day, celebrate burritos at Barito! Burritos are made from a heavy tortilla, which is wrapped around a selection of ingredients. The most common type of burritos has meat, cheese, tomatoes, rice, beans, vegetables, and sauce inside. However, many restaurants get creative with their burritos and offer a variety of unique combinations. Burritos are the perfect menu option for individuals of all diets. The versatility of burritos makes them an ideal treat for friends and family to enjoy together because burritos are customizable to an individual’s taste. When dining at Barito Tacos & Cocktails, you and your friends and family can order a burrito or two that is made with your favorite ingredients. At Barito, our burritos are made with your choice of whole wheat or flour tortillas. Each burrito is served with rice, beans, cabbage, jack cheese, and crema Mexicana. You can also top your burrito with cheese or smother it with sauce for a few extra dollars. Pick the protein for your burrito at Barito! Our menu includes Barito chicken, duck confit, roasted pork belly, porchetta al pastor, barbacoa, carnitas, seasonal fish (grilled or fried), shrimp (also grilled or fried), and seasonal vegetables. Pick whichever option sounds most appealing to you, or try something new at Barito this National Burrito Day! National Burrito Day is Thursday, April 4, 2019. This National Burrito Day, we hope you choose to celebrate at Barito Tacos & Cocktails! Diners can find our restaurant at 201 Main Street in Port Jefferson . We are open Tuesday through Sunday, and hope to see you here soon!